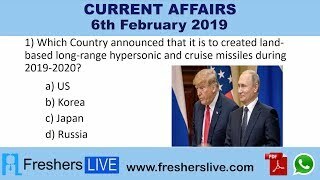 Current Affairs 6th February 2019: Instantly obtain Latest Current Affairs 6th February 2019 with all essential info, Be the first to know all the Current affairs 6th February 2019 top news, Major Issues, Current happenings, Important events in National as well as International level with clear explanation. For all competitive exams and Interviews, equip yourself with the Latest Current Affairs 6th February 2019 granted here. Axis Bank, UCO Bank and Syndicate Bank are penalized with a total of Rs.5.2 Crore by RBI Bank for violating the guidelines in regulatory compliance. The Segregation of the Penalised amount are as follows, Axis Bank and UCO Bank imposed with a Penalty of Rs.2 Crore each for their not committing with the norms related to payment through cheques. Further Axis Bank imposed a Penalty of 20 Lakhs for the detection and impounding of counterfeit notes. Food delivery startup Swiggy a Bengaluru-based AI startup Kint.io for an undisclosed amount. As part of the deal, Kint.io’s founding members Pavithra Solai Jawahar and Jagannathan Veeraraghavan will join the Swiggy team. Founded in 2014, Kint.io specializes in applying deep learning and computer vision for object recognition in videos. Acqui-hiring refers to buying out a company or an entity primarily for the skills and expertise of its staff rather than for its products or services. Ministry of Union Labour and Employment allowed women to work in mines, both in opencast and underground, during the day and night, as part of the efforts to build more opportunities for women. This decision has been taken in line with the recommendations of section 12 of the Mines act, 1952.